Gloriosa Superba (Kalihari) is an ayurvedic herb used due to its muscle relaxant, anti-inflammatory and analgesic properties. THIOCOLCHICOSIDE used in the Modern Medicine is a semi-synthetic derivative of COLCHICOSIDE, an alkaloid and active substance present in the Gloriosa Superba (Kalihari). It is also used for its muscle relaxant, analgesic and anti-inflammatory action. It is a GLYCINE receptor antagonist and GABAA receptor antagonist. COLCHICINE is also derived from Kalahari plant, which is used for gouty arthritis in modern medicine. Gloriosa Superba (Kalihari) is a common ayurvedic herb used for hundreds of years for the treatment of muscular pain, joint inflammation and pain disorders. The first description of its use in History appears in Charaka Samhita. In ayurveda, it is also used in the treatment of ear diseases and skin disorders. COLCHICINE is present in all parts of Gloriosa Superba. THIOCOLCHICOSIDE is also a derivative of Kalihari plant. 0.15 to 0.3% COLCHICINE content is present in tubers and seeds contain 0.7 to 0.9% of COLCHICINE content. COLCHICOSIDE is extracted from the seeds of Kalihari. THIOCOLCHICOSIDE is a semi-synthetic compound and derivative of COLCHICOSIDE. Gloriosa Superba (Kalihari) has following medicinal characteristics. Gloriosa Superba (Kalihari) is helpful in following diseases. Kalihari is used in all health conditions described above in therapeutic indications. Its main effects are on parasites, pain and inflammation. Gloriosa Superba (Kalihari) has antispasmodic and muscle relaxant properties. It also acts as emmenagogue, so it promotes easy flow of menstrual blood and gives relief from abdominal cramps and lower abdominal pain during periods. To enhance its effectiveness, it is used with coral calcium in Ayurveda. The dosage is used in dysmenorrhea is 125 mg four times a day with Praval Pisthi and honey. Kalihari root powder pack (lep) is applied over the affected part of the scalp. It helps eradicating fungal infection and stimulates the growth of new hairs. The Kalihari oil is useful in external abscess. The drainage of abscess before its application is required for maximum benefits. Kalihari oil is also applied within the genital internal walls to get relief from pain of the lower part of the female reproductive tract. Kalihari paste is prepared using Kalihari roots powder and water. All ingredients are mixed and heated until the oil remains with residues underneath. Then oil is strained out and residues are discarded. This oil is known as Kalihari oil. It is used externally as antiseptic and pain reliever. The dosage of Gloriosa Superba roots is 125 mg to 250 mg twice a day. The maximum dosage of Kalihar roots should not exceed from 1000 mg per day. Leaves of Gloriosa Superba are used in jaundice treatment in traditional ayurvedic medicines. Its dosage should not exceed from 4 grams a day. All these dosage are for therapeutic purposes only. You should not use it for a longer period. The maximum safest period of its use is about less than 30 days. Gloriosa Superba or Kalhari is a therapeutic and medicinal herb, so you cannot use it as supplement in any health condition. Your doctor may help you finding the best solution for you according to your symptoms and health condition. The dosage may also vary in every individual. Some people may not have well tolerability for this herb. They can feel restlessness, vertigo and nausea 2 – 3 hours or immediately after its consumption. Excess dosage can also cause stomach pain and severe abdominal cramps. 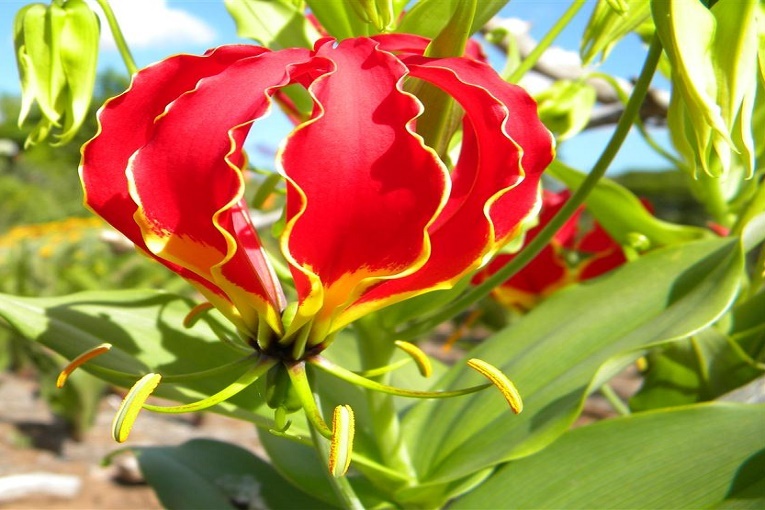 Gloriosa Superba (Kalihari) is UNSAFE in pregnancy and breastfeeding. It has toxin effects and abortifacient properties, so it can lead to miscarriage. In breastfeeding, it can release into breast milk and may result in adverse effects for newborn child. You should not use Gloriosa Superba (Kalihari) in following conditions. Sir plz help in vety. problem like mastitis, metritis, prolapse, indigestion with I am very thank full to you. There are several herbs and very difficult to list here. We will try to publish separate articles on each. Meanwhile, you can take advice from ayurvedic experts personally. Lajjalu (Mimosa Pudica) should help in uterine prolapse. Sir plz tell me some important herbs for buff. retention of placenta Thanks for response.